For students at one Wichita, Kansas, middle school, robotics education just got a lot more hands-on thanks to the diligence and dedication of teacher Brian Campbell. 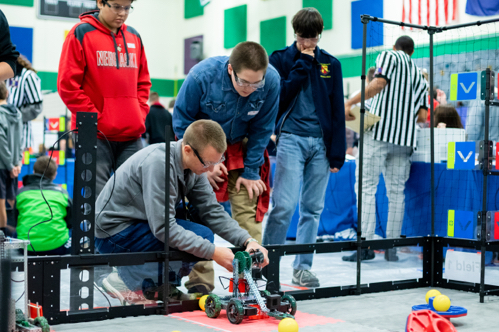 Last year, Campbell was one of six Wichita, Kansas, teachers to apply for and receive an educational grant from Koch Industries, using his award to purchase a dozen VEX V5 robotics controllers, batteries and cortexes (the “brains” of the robots) so his students – as well as students at five other city middle schools – can compete in local robotics tournaments. At Hamilton Middle School, where Campbell teaches, interest in robotics has steadily grown among the student body over the past four years, and he has created an after-school club where current and past students can work together. That growing interest has been a blessing for the program, though it has also put a strain on the supplies needed to adequately serve the students. But his kids have been making it work, and they’re even excelling in areas he never could have anticipated. Kids who might struggle in other classes are naturals at things like building and programming. And students who might otherwise never engage with each other or get along are working together. 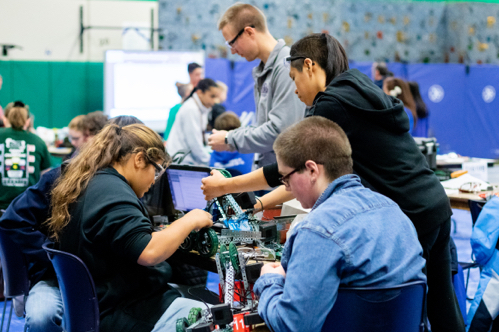 While robotics is teaching Campbell’s students hard skills like programming, mechanics and engineering to prepare them for the next level of their educational journeys, he’s also seen them developing important soft skills like communication and teamwork. Together, these skills are helping bridge gaps between students and break down barriers. As their teacher, he’s even been learning from his students along the way. Because Campbell’s kids didn’t receive their equipment until October, just one month before their first competition, the students only had a limited amount of hands-on time to familiarize themselves with the button layout and learn how to get the remotes communicating with their robots. So that very first tournament was a real trial by fire. But just as they’ve done every day in his classroom, Campbell’s students surprised him. 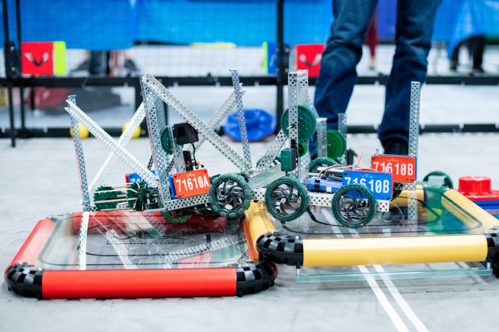 Competing against magnet schools and other programs with far more experience, that first tournament was only supposed to be a learning experience for his students … a chance to finally practice on a regulation robotics field. Technical difficulties led to a scoreless first match, but the kids quickly regrouped as a team to troubleshoot their issues. By their second and third matches of the day, they were scoring points. By the end of the preliminary round, one of his teams was selected by another school to compete in the finals as their partner. Although his students didn’t place in that competition, it was a morale booster that motivated the kids to tweak their designs and begin preparing for their next competition as soon as they got back to the classroom. 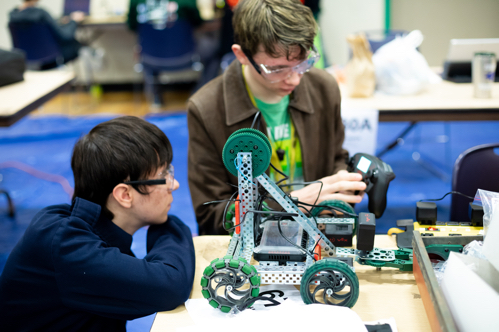 Now, they have their sights set on making the finals at their next robotics tournament.